The Bays Plan is organized around seven priority issues. 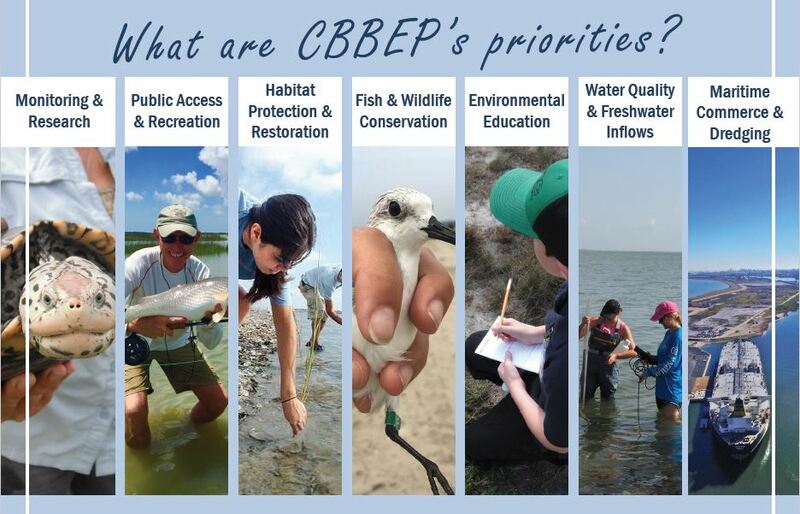 Each issue is the focus for an implementation team made up of CBBEP staff and community members. The teams recommend projects that address these issues to the Coordination Council for funding each year. Analyze environmental status and trends and research to address priority problems. Ensuring the wealth of bay resources are available for enjoyment, that people continue to benefit from a safe, clean bay system and informing the citizens of this community and our millions of visitors about how to enjoy the resources without damaging them. Managing colonial water bird nesting and implementing strategies to reduce crab trap by-catch. Educating citizens about the ecology of the bay system, its many environmental and economic values, and how individuals can make a positive difference to ensure its long-term health. Efforts include raising public’s environmental awareness, fostering community stewardship of bay resources, and increasing individual involvement in bay resource management issues. Necessary for a productive estuary, these inflows have been disrupted over the years, but new agreements and monitoring are in place to bring back the natural salinity gradients. Maritime safety minimizes possibility of accidents that could impact the marine environment. Channel maintenance through dredging also considers the best use for that dredge material, in building up eroding islands or providing bird nesting habitat. Monitoring and researching pollution from nonpoint sources or historical contamination may help improve areas that have failed to meet state standards or are closed to shellfish harvesting.